An overall view of the display area of the Museum. A bus group of visitors viewing the displays. Bus tours or groups of 20 or more who book ahead have the opportunity of receiving a guided tour and homemade morning or afternoon tea for $10 per head. 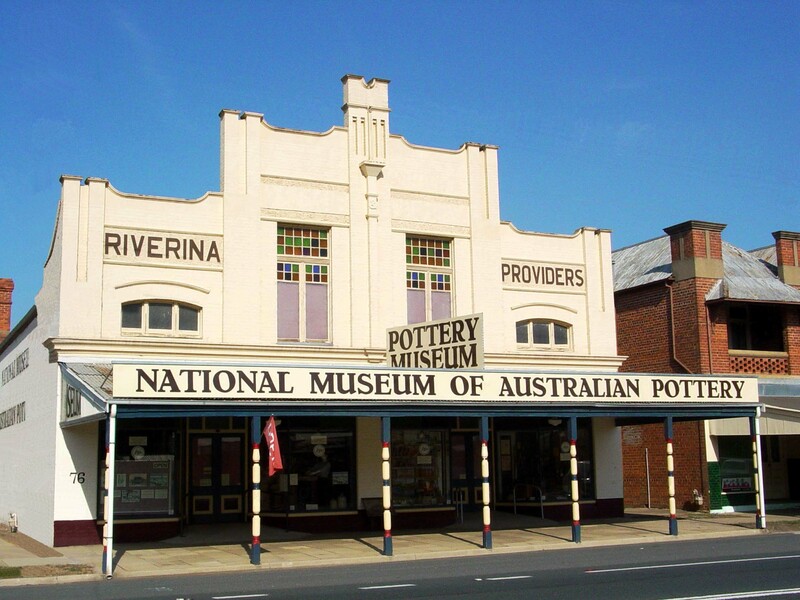 The Museum is situated in the main street of Holbrook NSW at the southern end of town in the historic precinct area. Would you like a unique opportunity to further your knowledge and appreciation of our early Australian pottery heritage? 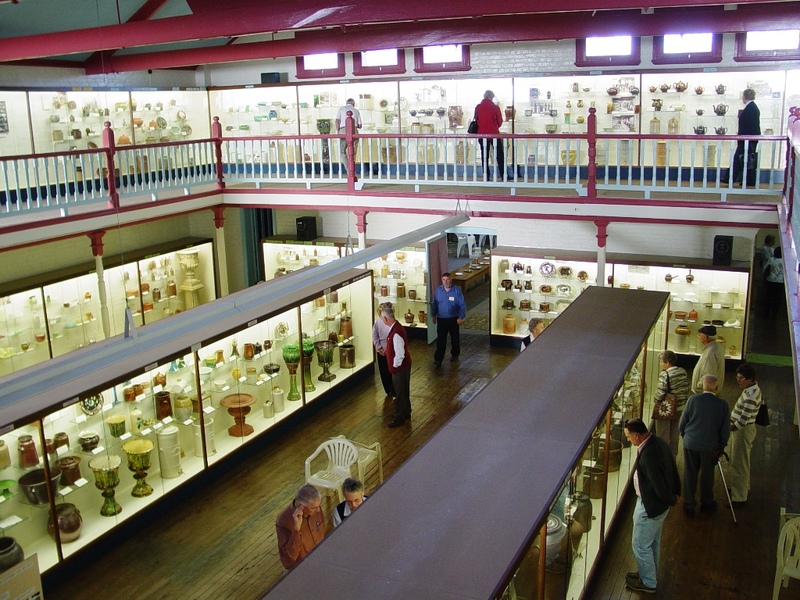 Then why not visit the National Museum of Australian Pottery which is the only Museum dedicated to 19th and early 20th century Australian pottery and is the culmination of many years of collecting and research throughout Australia. On display are over 1,500 pieces of domestic pottery from over 120 Australian pottery companies established between European settlement and 1920. Amongst the extensive range of pottery wares, such as simple preserving jars, jugs, colourful cheese covers, beautiful bread plates and elegantly decorated water filters are a few rare examples of pottery made by the convict potter Jonathan Leak, who’s few surviving pieces are the earliest marked pottery produced in Australia. Also on display are over 100 original photographs, showing the interior and exterior of many potteries, exhibition displays and portraits of the potters along with catalogues, price lists and numerous old advertisements. The Collection represents in many ways the struggle, courage and determination of many of our early potters who, often under difficult circumstances, produced basic and decorative domestic pottery, frequently with spectacular results. 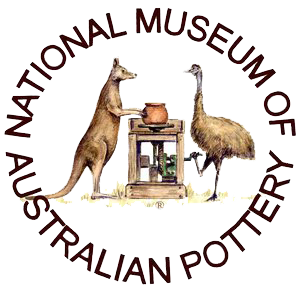 So come and spend some quality time in Holbrook at the National Museum of Australian Pottery with Geoff and Kerrie Ford. Children under 16 years of age $4 per head. Family Passes (2 Adults, 2 Children) $15. Delicious homemade Devonshire Tea $10 per head, includes admission. Bus tours or groups of 20 or more who book ahead will receive a guided tour and homemade morning or afternoon tea for $10 per head. Closed Wednesday and all of August.